We don't know how many Ascended are there since you can perform the Ascension, or similar to it (e.g. Cantha), anywhere. We know how many there are in the time of GW2, which is ~0 because Ascension has not worked for generations (and all the people trying to figure out how to make it work think they need to head to Augury Rock). Despite that, people come and go from the Mists. The PC, Taimi, and Braham pursued the Aetherblades to the Edge of the Mists. None are Ascended. The entire party visits Kormir's realm. None are Ascended. Ascension is one of many ways to gain powers like True Sight or mastering multiple professions. There's no evidence it's required to traverse the Mists. Ok, let's try this one more time. If a human died and went to the Mist, I don't think they can ever come back. The only human that can come back from the Mist are the Ascended ones. I don't remember a non-Ascended human to ever come back. However, that was the GW1 lore that no longer applies in GW2. In GW1, it is required according to Turai. In GW2, not anymore. What specific dialog are you thinking of? I wasn't talking about the Prophesies event in particular. The Nighfall event was on 1075 AE, the War in Kryta event was on 1079 AE where Elonians are helping Princess Salma to repel the White Mantle. Elonian, if not Ascended, should not been able to see the Mursaat during the missions. Only if they wanted to be unseen, and nothing suggests they do. Could be argued as an oversight by ArenaNet, or it could be argued that canonically the NF hero does not partake in War in Kryta events. The Prophesies are just vision, Turai is the interpreter of that vision. How else would he had figured out that Glint is in the Crystal Desert and to conduct that Ascension there? You said it yourself, the Prophesy didn't say anything about the location., which proves that Turai can interpret the Prophesies to an extent. We don't know how Glint came with the prophecy, vision or no, but Turai is not interpreting the vision. He's interpreting the prophecy that was written by Glint who foresaw the future in some manner. The Prophesies are Glint's visions. There's literally nothing that confirms this proclamation, and even then, Glint wrote them. If Turai is interpreting anything, it's the written verses that he had access to, and the original says nothing about the Crystal Desert. And please don't misrepresent my claim. My initial claim was, "the only human that can come back from the Mist are the Ascended ones" which is true. Just because the Devs got lazy and didn't add an Ascension ritual in NF doesn't necessarily means that the heroes are not Ascended. There are so many proofs that the NF heroes are Ascended you're just trying to deny them. So you're saying that these guys are Ascended then? Your argument is pretty much proclaiming that every Tom, kitten, and Harry in Elona are Ascended, have somehow undergone a ritual that is literally a once-in-a-millennia kind of thing, where even in Cantha where it has a more common equivalent, it is seldom performed and managed, where at best, only the Emperors manage it. Despite zero probability of it. Despite the fact that Ascension is rare as hell, that the Prophecies PC and henchmen were the first to do it - ever - and by GW2, the last? The mechanical limitation is based on the lore. The GW manuscript states, "For a long while, the Rift and the Hall of Heroes were accessible only by those who had passed from the mortal world into the immaterial. It was the Land of the Dead, an exclusive club whose membership cost the blood of one's own life. But within the last century all that has changed." It is describing the Ascension ritual where non-dead humans can go to the Mist, then to the Rift, then to the Halls. No, it's describing Lord Odran kitten kitten up by making portals to the Mists for everyone and anyone to use. If you were to take it into context, it literally comes above the section titled "Lord Odran's Folly" as it's preceding line. It's literally leading into the lore of Lord Odran, and the fact that because of him, mortals have "easy" access to the Mists that hadn't existed before. It's not referring to the 10 or so henchmen and GW1 PC that managed to be the only people ever to undergo the ritual of Ascension. Sorry but the Flameseeker Prophesies predates the provinces of Elona by hundreds of years. Which means the Ascension process has been known in Elona for a very long time. Turai learned about it after studying ancient wisdom in Elona. Ancient wisdom means, they are oral tradition passed down for generations. The Tombs of the past Elonian kings is located in the Crystal Desert because it is part of Elona. Why would they bury the Primeval Kings of Elona in Tyria? That makes zero sense. Only after the Great Dynasty ended that the provinces of Istan, Kourna, and Vabbi existed. If you click on the context of Tyria from the wiki, you'll find this, "Crystal Desert - Vast desert on the boundary with the nation of Elona." Then if you click on Elona, you'll find this, "The Crystal Desert lies north of Elona" -- it's always been part of Elona. Mechanically for GW1, the Crystal Desert is part of Tyria -- mechanically. However lore-wise, the Crystal Desert is always been part of Elona. Crystal Desert is part of Continental Tyria, but was part of the Kingdom of Elona. It, however, was never part of the continent of Elona. ANd yes, the Crystal Desert lies north of Elona, not 'is part of Elona'. You have to re-read it carefully. It states, "For a long while, the Rift and the Hall of Heroes were accessible only by those who had passed from the mortal world... It was the Land of the Dead..." -- meaning you have to be dead to get there. So what changed? Mortals gaining access to the Hall, specifically the Ascended, changed all that. "The Chosen ones will come and help me gain access to the Mists and pass into the Hall of Heroes"
"I was one of the Chosen. But I passed from this world before I could rise to Ascension"
"The tests of Ascension can only be performed by mortals." "I know that it will be I who leads them (The Chosen) through the treacherous afterlife to the top of the Hall of Heroes"
Just like the Great Zehtuka, Lord Odran had done things that only Ascended mortals can do and we have little information about them. The only thing we can use is what happened to the Chosen and the trial they have to go through to enter the Mist. Turai cannot move on because he has unfinished business. He doesn't Ascend, he moves on because he helped someone reach Ascension. He never reaches Ascension - you literally quoted proof against your claim. Turai states: "Ascension can only be performed by mortals." The dead are no longer mortal. Nothing suggests or implies that either Zehtuka or Odran were Ascended. Nothing suggests or implies that the random Order of Whispers members seen in the Realm of Torment are Ascended. Or the Forgotten seen throughout the Realm of Torment. Or hell, how about the fact that humanity came to the world from the Mists - by your definition, every human at that time would be Ascended. And given that they entered the world without magic, it seems pretty unlikely that they had awakened their magical potential. I guess the big hole in Kamadan that transported my NF character and gave them the buff "Journey to the North" was just my imagination. And about the Asuran tunnel and their gates that connects to all the continents are nothing but nonsense. The Eye of the North is what brought my NF character to Kryta, so when the War in Kryta event happened, my NF character was already there. To say that they did not partake is ignoring the big, fat, rainbow-colored elephant in the room. Glint said it herself, "It was almost eight hundred years ago when I foresaw the Flameseeker Prophecies"
Turai has access to more than just what was written. Elona has a established oral tradition, this is why when searching for Vlast's birth place, we seek for information verbally rather than searching in a library. The commander is introduced to this tradition when we're out there looking for The Way Forward. The quest lead to an elder who's the only one who remember Kesho. Seeing that only the elder lady knows the name of the lost city shows that the oral tradition is starting to fade. However, during Turai's time, this tradition was alive and well. You would not find Kesho written anywhere, we only know about it through verbal communication. Other than those, we also know that Glint didn't wrote every thing down. She has a lot more to say about the Prophesies when we spoke to her. Which is proof that many information was passed down verbally in an oral tradition. And when you said, "Glint wrote them", do you mean she literally picked up a pen and wrote things down? I doubt it. It is highly likely that she has someone to take notes and write for her. Nothing in the Prophesies mention of Glint's name, yet Turai knew that she's the prophet, which is another proof that there is an oral tradition in place. Heroes are Ascended, henchmen are not. Heroes are allowed in the Mist, but not the henchmen. If this just some kind of mechanic put in place and Ascension is just some kind of a gateway, then why does Heroes and Henchmen get different set of rules when entering the Mist? If the Dev didn't get lazy, I'm positive that the Ascension process would have taken place in the Sunspear Sanctuary. Then the lore is wrong to say that, "It was the Land of the Dead, an exclusive club whose membership cost the blood of one's own life." That sentence is one big fat lie. Opening a portal doesn't change the fact that it was the "Land of the Dead" and it doesn't give mortal "easy" access either. The obvious geographical divide that separates the two the continent is the Blaze Ridge Mountain that extends to the south of Ascalon all the way to the sea. There is no obvious continental divide between the Crystal Desert and the nation of Elona. An entire year passed between EotN and WiK and there's nothing really to suggest the other NF or Canthan figures remained. Foreseeing doesn't necessarily mean having a vision of future events... People use that terminology all the kitten time when predicting events, doesn't mean they actually watch it occur in some sight beyond sight scenario. Turai could not have access to more of the prophecy than what actually exists, and the whole prophecy was written on those verses. He rather had less than the whole prophecy, as no one had the full prophecy. Your "oral tradition" argument is rather kitten, by the way. And yet henchmen go into the Realm of Torment. Well, then you're wrong. Sorry. I mean, it kind of did give mortals easy access, since they can just walk through the portal. As opposed to, y'know, dying. By that argument, Orr is part of Elona. But you'll never find a single piece of information proclaiming that. Speaking of which, I imagine when the Crystal sea was still around Orr was probably an island rather then a peninsula or maybe a group of islands making up the area. And also in regards to the Crystal Desert and Elona, we have to remember that the Crystal Desert used to be a sea, which would make for a perfect continental divide. The events in EotN leads to the events in War in Kryta. There's even less evidence to suggest that the foreign Heroes will simply have left even knowing the current state of Kryta. That's what "foreseen" means; seeing events before it happens. I don't know what else to tell you. Well I guess Turai is just a divination genius with neigh omnipotence since he has relayed a lot of information that you cannot find in books or scrolls. The only logical explanation is that Glint's has been passing down information verbally and history is taught through oral tradition. Being skeptic is fine, but shooting an argument down without counter-argument is a very weak position. Your counter-argument is not very convincing. Easy access would mean that the portal is located in the middle of a town where any passerby can simply walk in to. Even dying didn't gave Turai access, he has to Ascend. Nope. Orr is clearly part of Tyria based on the geographical divide showing that the edge of the Blazeridge Mountain is pointing south of Orr to the sea. From the Wiki; "The Kingdom of Orr was the first human kingdom established on the continent of Tyria, created by both god and man." You're trying to put me on a position I never made. Nice try though. The events of Eye of the North have next to no bearing on Kryta. It was involved with the asura, norn, dwarves, and human-charr conflict. If the heroes remained for any threat, it would be to fight charr, not a civil war that was barely even a backdrop and totally unrelated to their own cause, with no real proof of which side is the "righteous" side other than he-said-she-said at the time. Not literally seeing. I can foresee that there will be another election in the US coming up in 2020. Doesn't take me the ability to literally see images of the future to foresee this. I doubt Nostradamus literally saw visions of the future when he foresaw his various prophecies. It tends to mean that more literally in fantasy, but it's not exclusively so. It's just the act of predicting, regardless of means. The only logical explanation is that Turai made logical deductions based on the information he had at hand, such as the fact that the only way to Ascend in the known parts of supercontinent Tyria being Augury Rock. So? Like I stated, that is a mechanical limitation, not a lore one. Your argument has been that one must Ascend in order to go into the Mists phyiscally. Devona and co. Ascended, yet they cannot go into the Underworld in Cantha or Elona. Kihm, Odurra, Herta, Sogolon, and Gehraz did not Ascend, nor did any of the Heroes, yet they can go into the Realm of Torment, and the latter can go into The Underworld and Fissure of Woe. It is a purely mechanical limitation. The dialogue is an outdated (as of Factions) attempt to not break the 4th wall in explaining a mechanical limitation for why players could not go into the elite missions of the initial game. Turai didn't Ascend, and thanks to a retcon with Path of Fire, he never moved on to the Mists despite stating he would once the Chosen Ascended. He didn't move on because he had unfinished business, the reason for any ghost to remain in Tyria (except, arguably, the Primeval Kings and their servants at the Tomb). The Blazeridge Mountains is north of Orr and physically divide all land access Orr has to Central Tyria. Before the Exodus, the Crystal Sea furthered that divide. I know what the wiki says. Chances are I wrote that line, tbh. But the position you made is the proclamation is that the Blazeridge Mountains' southern edge separates continental Tyria from continental Elona. Well, Orr is connected to the land south of the Blazeridge Mountains, not the land north of it. Orr connects to Scavenger's Causeway, which connects to the Crystal Desert via the Desolation, which (post-Exodus) connects to the Blazeridge Mountains, and from there connects to the Shiverpeaks and Ascalon. Technically speaking, Elona shouldn't be considered a continent, as it is part of the supercontinent called Tyria. If it were, then Orr is geographically part of the Elonian continent. I'd imagine that it connected directly to Kourna, given that is a series of mountains. I guess Abaddon's defeat on the coastline could have shifted the continent enough to create those mountains, but I find it largely unlikely. Given the lore about Marga Coast being where Margonites made landfall in the continent of Elona, I imagine that Turai's Procession (or nearby) was originally a river or strait connecting the Unending Ocean to the Crystal Sea, and that the island/peninsula that was Orr was Orr, Scavenger's Causeway, and the western mountains (including where Kralkatorrik landed before going into the Mists). The only way out of Tyria is through Lion's Arch if they choose to leave and go back to their own countries. And if the heroes have gathered there, it is highly likely that they know about the situation in Kryta. As the story goes, the heroes participated in the War regardless of what side they pick, which means, the non-Ascended heroes can see the Mursaat. Non-Ascended heroes didn't receive the Gift according to you, yet they can see the Mursaat. Prediction happens when Glint choose which future is favorable and doing her best to guide all the pieces towards that favorable future, thus what she had foreseen becomes a prophesy. This is why certain things has to be done to fulfill the prophesy. All the pieces needs to be in the right places. Any deviation of event will not lead to that prophesied future, rather it will lead to one of the visions that Glint foresaw. The Commander and Aurene have literally seen many futures which they also call visions. This is no different than what Glint saw. Then everyone are trying to decipher that vision to make a prediction for a favorable future. Sorry, but you're grasping at straws now trying to be technical about it when the meaning is already clearly understood. And what information are those and where did he obtain them? Nothing is written about Glint, the Crystal Desert, nor the Ascension. You said it yourself. Yet somehow Turai figured it out just by reading the verses of the Prophesies? I highly doubt that. The more logical scenario is Turai heard about the Prophesies from an elder keeper of their oral tradition. This is where he got all his information and I'm sure that this is also how he'd known of Glint, the Crystal Desert and the Ascension. Devona and co didn't join me in the Ascension process in the Desert. So no, they are not Ascended, thus they cannot enter the Underworld. They are labeled Heroes as oppose to Henchman for a reason. They are Heroes just as my main character is a hero. Only heroes enters the Underworld. Henchmen are not heroes. This is not a decision based on mechanic, but on lore. Well Turai's Ascension is riding on the Hero's back and without the Hero, I doubt he can get back to the Hall. The Primeval Kings' business if to protect that tomb, posibly the portal to the Mist, so that business will never be finished. I have this huge GW1 EotN poster map where you can clearly see that the Blazeridge mountain clearly separates the Desert from Orr, where Orr is on the north side of the mountain and the Desert in on the south side. The Scavenger's Causeway consists of mountains that are part of the Blazeridge. 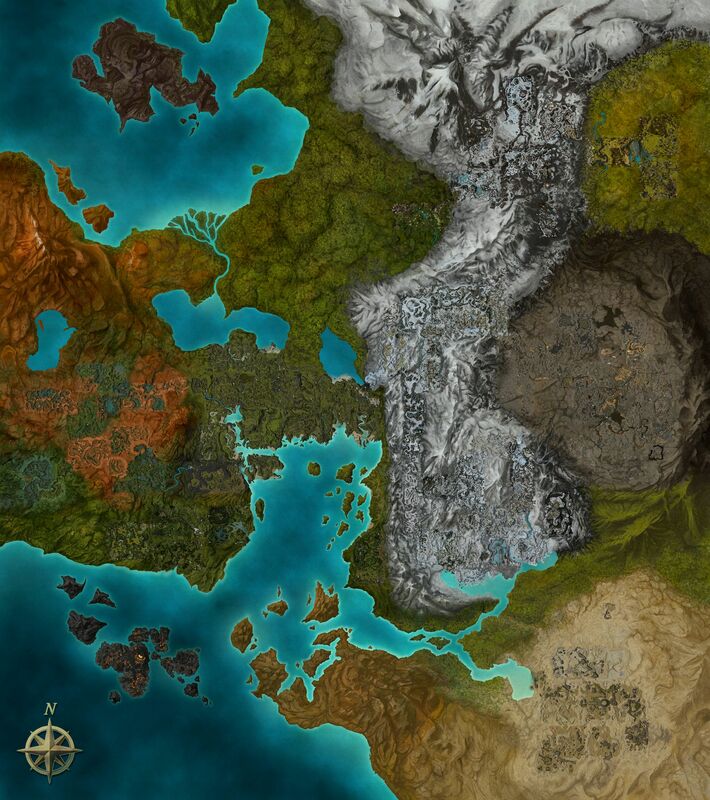 Geographically, the Blazeridge mountain range was created when the two continents, Tyria and Elona, collided due to the movements of the tectonic plates. It is not logical that Orr as part of the Elonian continent yet ended up north of the mountain range when the continental collision occurred. That makes zero sense. There would be additional methods out of Kryta, such as a docks on the Tarnished Coast, or a remade asura gate. Besides all that though, there were seven mursaat, half were killed in assassination attempts before they could hide, the rest were directly assaulting LA and Zinn had some device to make them vulnerable. As presented before: Mursaat must make themselves invisible, they're not invisible all the time. When things get written, their author is known. Glint compiled the Flameseeker Prophecies, and that was known. Ascension can only occur at Augury Rock, and that was known. It didn't have to be part of the prophecies themselves for Turai to know these things. However, if there was an alternative means of Ascension, then he couldn't know to go to the Crystal Desert for Ascension, because it could end up meaning he'd need to go to the other location of Ascension. Yet they fight mursaat en masse, so they had the Gift of True Sight. They also are in the Realm of Torment, which is connected to the Underworld. Your arguments are becoming self-contradicting. Besides, before they become henchmen, they're repeatedly showing up alongside the PC in side quests, including a quest to scout Augury Rock. In the lore, they did Ascend. Those I listed are henchmen. You might want to do some actual fact checking before continuing. And? I never commented on that (though you are wrong; the distinction between henchman and hero is purely mechanical). I'm stating that Ascension being a requirement to enter The Underworld / Fissure of Woe is a mechanic, not lore, restriction. You used that restriction to proclaim one must be Ascended to enter the Mists physically in GW1 lore. I'm saying this is not true. Whether or not henchmen were allowed in The Underworld/Fissure of Woe is unrelated. They died before being taken to the Tomb, long before the portal was made, so that couldn't be possible. Then you can see that the Blazeridge Mountains meet the Shiverpeak Mountains (which is the statement given in The Ecology of the Charr, in fact; which, might I add, was the very first time the term "Blazeridge Mountains" was ever used in the lore) The mountains are disconnected from Orr by the river that leads to Amnoon Oasis. Orr connects only directly to the Crystal Desert, The Desolation, and after a bit, Kourna. True, but LA is the gathering hub. I disagree. Mursaat are invisible to those who didn't receive the Gift of True Sight. Otherwise, what's the point of the Gift? Rather, then can grant their own version of the Gift to their follower so that they see their gods, albeit temporarily. This is the only way that the members of the White Mantle can see them. The information about the Prophesies and the Ascension begins with Glint. Turai simply followed that trail of verbal information which lead him to the Desert. You're also confusing one fact that Glint wrote the Prophesies, she didn't. She merely compile them and some one else have written them, no different than someone compiling the books to form the Bible. The actual written text are found in Elona probably years after Glint have compile the prophesies. In GW2 we know that Glint is practicing oral tradition by leaving her knowledge in crystals. So it is logical that when she see visions, she records her vision in one of the crystals. She never wrote anything down. These crystals that contains the Prophesies might have found by some Elonian scholar during the reign of the Primeval Kings and wrote them down. If there is any contradiction, it is due to the facts found in the game. I'm simply taking one side over the other that makes more sense to me. You are free to disagree. You said, "and the latter can go into The Underworld and Fissure of Woe" which is pertaining to the Heroes, which I replied, "They are labeled Heroes as oppose to Henchman for a reason"
What exactly are you rebuking? It is related since it distinguish those who Ascended from those who did not. I know that the henchmen didn't Ascend so it makes sense that they cannot enter the UW/FoW. The way that the portal lies behind a gated wall is proof that the portal has been there before they made the Tombs. If you're talking about the portal that Odran made, I don't think this is one of them. The GW2 wiki is wrong on this one. Looking at how the sarcophagus are layed out, this portal has been here before the Scarab Plague killed the Royal family. They were building around this portal. They knew that his leads to the Mist so the decision to lay the sarcophagus close to the portal makes a lot of sense. Technicall, it is the Steamspur Mountain that meets the Blazeridge perpendicularly, but the Blazeridge mountain range continues on to the Scav's causeway. The fact still remain that the Crystal Desert lies south of the Blazeridge mountain range. And? I never commented on that (though you are wrong; the distinction between henchman and hero is purely mechanical). I'm stating that Ascension being a requirement to enter The Underworld / Fissure of Woe is a mechanic, not lore, restriction. That's going too far: Prophecies Ascension was always characterized as a set of trials that enabled the test-taker to gain the attention and favor of the Six, who would actually enable them to Ascend. Access to FoW and UW was restricted to those considered worthy by the Six (worthy of what? fighting the minions of an evil god. The restriction is more for the protection of the unascended than as a special privilege for the few). Obviously those who went through Prophecies Ascension have already proved their worth. I guess they treated Weh No Su as worthiness transfer credits. And Sunspears, by the middle of Nightfall, are already showing they can hold their own against demons, Ascended or not. But the mistake would be in regarding it as a question of "ability" rather than one of "permission". To get to the Mists, all you need is a portal. But to get someone to make you a portal, or let you use one, that's a little different. Someone like Odran could make his own, as could some of the Elder Races, and the Asura. Everyone else had to pray for an assist, and the answer was normally "no". It's been a long time, but I think the Avatars were originally the only means of going to UW and FoW before portal scrolls? So it was more clearly a case of the gods directly intervening to give the player access.